@ The Detroit Institute of Arts, Detroit, Michigan. Photograph by Dirk Bakker. 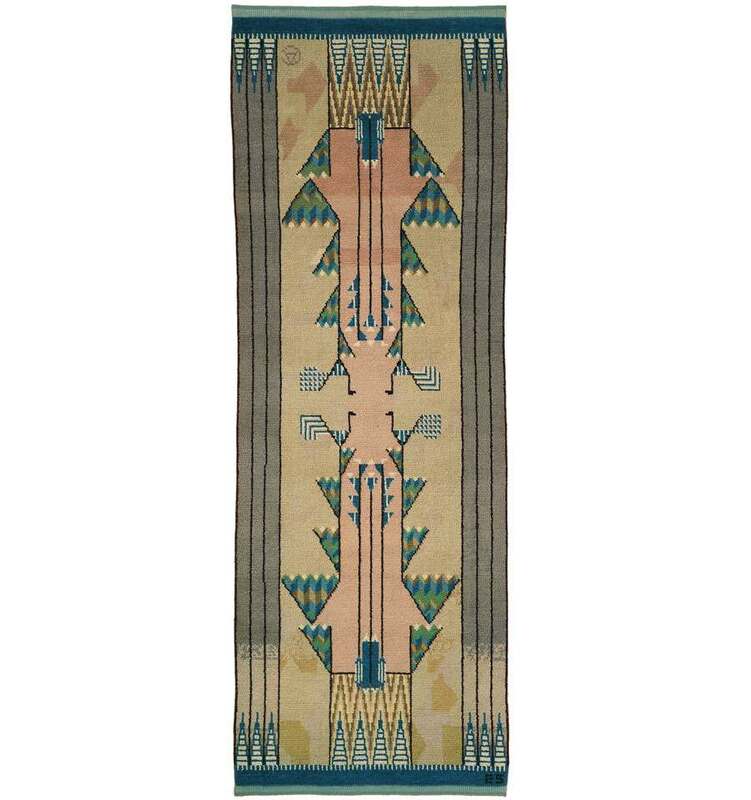 In 1928 Loja Saarinen, Eliel Saarinen’s wife, established Studio Loja Saarinen, a commercial weaving studio she operated at Cranbrook until 1942. Her studio created textiles for special commissions, the bulk of which were for Cranbrook and included rugs, window treatments, and upholstery fabrics for Kingswood School Cranbrook (founded as a school for girls in 1931) and Saarinen House (1930, the Saarinens’ Cranbrook residence). Studio Loja Saarinen employed primarily Swedish weavers who worked in a traditional Scandinavian ryijy technique, hand knotting tufts as they wove. These new ryijy rugs complemented the Saarinens’ interest in and collection of historical examples. Loja and Eliel Saarinen designed this second rug woven by Studio Loja Saarinen, in which Eliel’s initials appear in one corner and Cranbrook Academy of Art’s “CA” monogram in another. The peacock motif, which occurs repeatedly in the Saarinens’ designs for Cranbrook, emphasizes that this rug, though destined for use in Loja’s studio in front of a bench of equal width, belonged to a larger scheme for the campus.